So Halloween is officially 24 days away and for those who havent decided what to be yet, where to get it from, how much they really want to spend on a costume, this one is for you. Honestly, who actually gets their costume from Party City or a Halloween store? No judgment, personally I’m not spending $50+ on something I’ll wear for one night. I will buy bits and pieces from different places which makes more sense to me. So I’ve come up with a list of 12 cute and inexpensive Halloween costumes, some which you can do with your partner or rock the look on your own . Either way, lets get started! I honestly love this one mostly because all you need is a red bathing suit and thats it, people will get it. If you want you could find some iron on letters at Michael’s and add “Bay Watch” or “lifeguard” to the suit too. Some finishing touches would be whistles and sunblock on your nose and boom you’re ready to save lives. So last year my boyfriend and I were so last minute with our costumes. We literally made our zombie costumes the day of Halloween a couple hours before we were going out. All we bought was fake blood which was a good deal! The costume was an old white shirt and we ripped it in certain areas, black bottoms and sneakers. 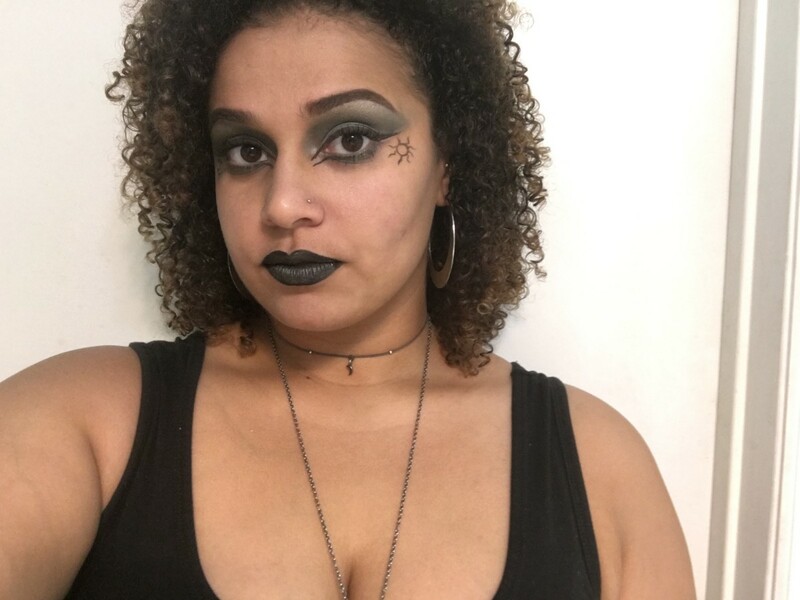 For makeup I added black lisptick around our eyes with green and purple eyeshadow. We added blood to our face and clothes which was the finishing touches. We got so many compliments which surprised me considering we just made the costumes. Click here for the Instagram post about it. I swear I’ve been a witch for like 8 Halloween’s in a row. When I was a kid that was my favorite thing to be. Plus now that I’m older I just use things around my house to make the costume stand out! (Witch details are in the description of Gypsies). Honestly the Witch and Gypsy are fairly close when it’s a DIY type of costumes. 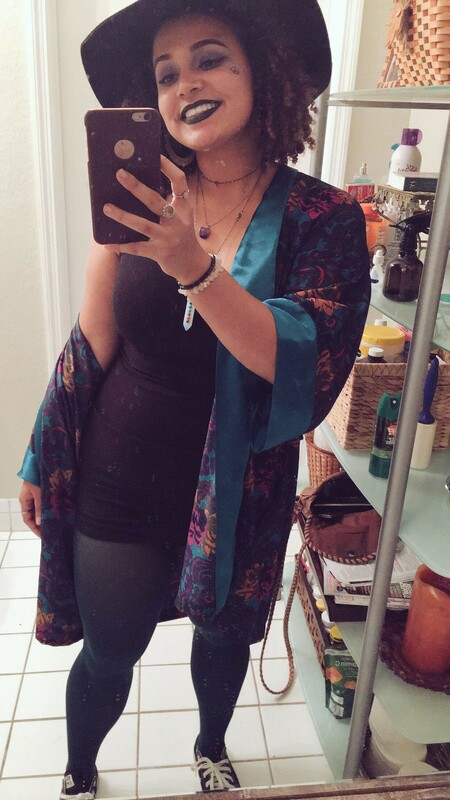 For the witch I gather all my crystals and long jewlery, some article of clothing that’s flowy and a hat. For the gypsie I pretty much do the same minus the hat. When is comes to makeup its up to you, if you get the outfit right the makeup is irrelevant. Its just a super fun extra thing to do! People will get it, which in my opinion is the point so it was great with this one! I didn’t spend a dime and people knew what I was. When you think of a spy what do you think of? To me, I think of all black. So thats what you do, black pants or jeans, black long sleeve shirt and then to seal the deal you can add a tool belt (black of course) and add equipment a spy would use on it. I honestly think a bunch of random items would work because spies usually have random objects that do amazing things. Wow, aren’t you a little upset this is here? This is too easy now. Go watch the movie again and then find your best white tank and cut some holes so that amazing purple bra shows and work that look girl. This is such a cute couples idea. You buy a superman shirt and then both of you wear a button up white shirt with some of the buttons undone the super man shirt underneath, black bottoms and black shoes. You can literally wear your work clothes or best business attire and now you’re ready to save the day! This costume is so quirky, I love it! All you need is a big button up shirt with a floral print on it, some khaki shorts, sneakers, high socks, a big hat, and one of those disposable cameras. All of this can be found at Goodwill or local thrift store! This costume would be cute by yourself or a group of your friends. So again with the all black. This time paint a little black mask on your face and carry around a big bag, a pillow case would work. Fill it with some light things, like feathers to make it seem full and have some pearls in your hand. This can be a couple costume too, I think it would be funny if one of you were carrying a lamp, to really seal the deal! We all have those 3D glasses somewhere in our house or just get some from the theater, while you’re at the mall swing by Hot Topic and pick up some suspenders. Now all you need is a white button up shirt and any bottoms and shoes you want. Carrying a book or two would be a nice touch. I haaaaaaaad to throw this one in there. Ladies (or gents), grab your best plaid dress (or any dress you like) and white aporon for this one and some fake blood of course. I would add the yellow rubber gloves and a bloody knife as well. 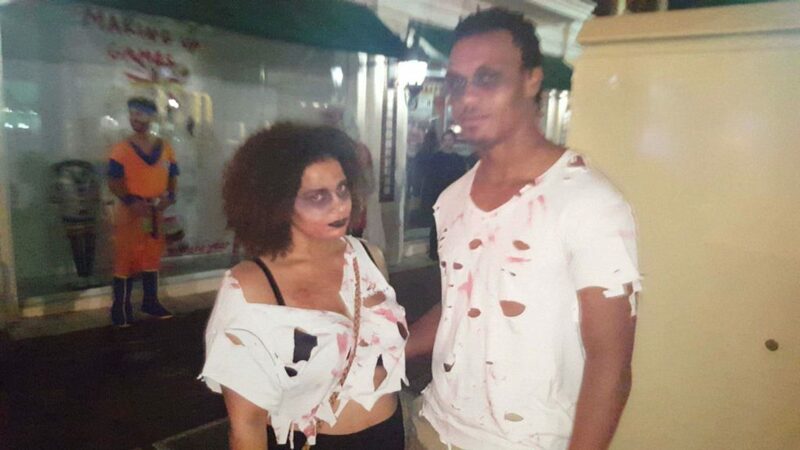 You can do this as a couple costume as well, he or she would obviously be the dead spouse. Okay everyone! Those are my 12 super cute and inexpensive Halloween Costumes. Let me know what you think (comment section is all the way at the bottom.) If you end up doing any of the ones I suggested send me a pic! I would love to feature you on my page!! ttyl loves, and have a great weekend!